As with any short story collection, the tone and quality varied quite a bit between stories. There was only one that I actively disliked (“Ironheart” by Jonathan Maberry was just whiny and depressing). Some of the cleverest ones riffed on classic fairy tales (e.g. Pinnochio, The Tempest, A Midsummers Night’s Dream), but my favorite was the hilarious “Three Robots Experience Objects Left Behind from the Era of Humans for the First Time” by John Scalzi. 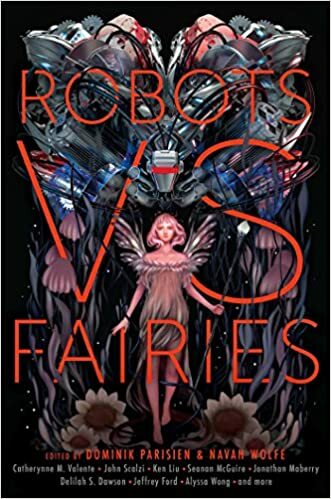 Only one story featured an actual robots vs. fairies conflict, which I found surprising given the title, but the variety that was present made this a highly entertaining collection that was greater than the sum of its parts. In unrelated personal news, the move up to Michigan is moving steadily along…just put in an offer on the house (5 minutes from the beach!) and should have a definite move date by Tuesday. Yeah, not as much as the west side of the state, but there’ll be some. The chaos of moving is now in full swing. This really was a great collection with a unified theme but good variety. Oh good luck with it!